One of the things I do a few months out of the year is co-coach my son’s FIRST LEGO League (FLL) team. We would do it year round – and many teams do meet year-round – but I have another life that sometimes intrudes. One of the cool things about FLL – apart from LEGOs and robots, of course – is that each year teams must devise real-world solutions to real-world problems. Sometimes, what they come up is amazingly effective – so effective companies actually are interested producing them. There’s even an award for the team producing the most practical, feasible solution. Teams from around the world compete for the Global Innovation Award. Two years ago, an Ames team won the first such prize. This year, another Iowa team is in the running. 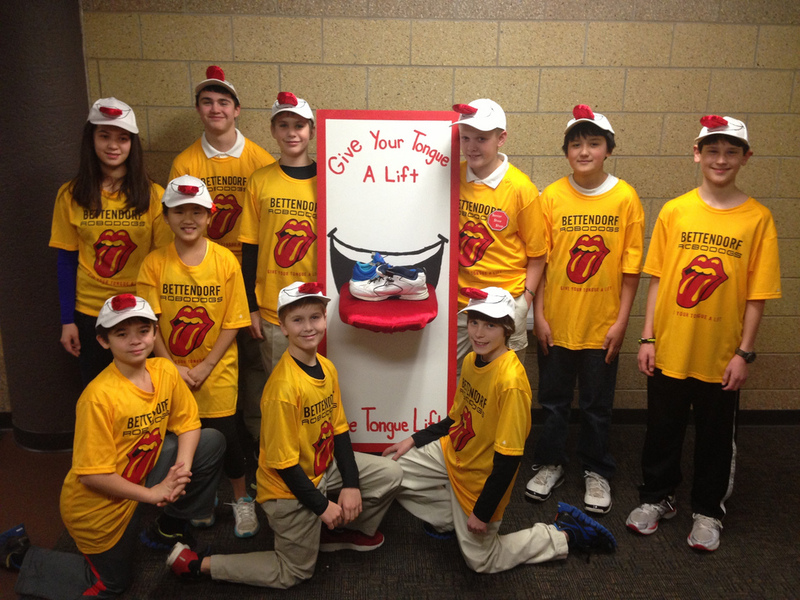 Bettendorf’s Robodogs, team members ranging from a fifth-grader to two eighth-graders, have a chance to equal the Flying Monkeys’ accomplishment. Team members are Logan Zweifel, Jackson Callahan, Tyger Callahan, Cara Mastunduno, Hogan Mastunduno, Ryan Longnecker, Haylie Spencer, Cole Hunter, Dennis Davis and Andrew DelVecchio. A panel of experts will look at the top 20 entries, and choose three finalists to travel to Virginia in June. There, they’ll learn who will get $20,000 and help developing their product. The runners-up will get $5,000 each. The team was inspired to enter its solution for the Global Innovation Award when their project got first place in the project category. 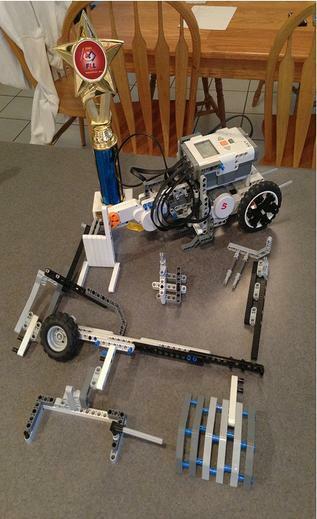 That wasn’t enough to get them to the world festival (the World Changers at Trinity Lutheran School in neighboring Davenport got that honor and go to St. Louis April 24-27), so the Robodogs set their eyes on the innovation prize. The team’s solution is called the Tongue Lift. You know how it often takes two hands to pull on athletic shoes, one to hold the padded tongue out the way and the other to pull on the shoe? It’s tough going for a senior with limited mobility, as the Robodogs learned by talking with a team member’s grandmother, a recent hip surgery patient. The Tongue Lift is a combination of binder clips, toggles and elastic shoelaces. The clips hold the tongue out the way. The elastic shoelaces and toggles keep the shoe snug, but adjustable. The user pretty much can slide their foot in. The solution is better than slip-ons and loafers, the team says, because athletic shoes offer better stability and comfort, and it lets users adapt their existing shoes, which research shows is better than trying to adjust to new shoes. Even if they don’t win the top prize, the Robodogs already have a nibble from a company interested in marketing their idea. As part of the project each team member contacted a company they thought would be interested in the Tongue Lift. Gold Violin, a distributor of products for people with limited mobility, is interested, but the company would only distribute the product. The team must find someone to take it beyond binder clips and toggles. They’re optimistic, Maurer says. “It’s simple and practical and easy for someone to make.” That’s why the team thinks it has something worth pursuing. The Robodogs are, um, big dogs in Iowa FLL. In five years, they’ve been to state the last three years and in 2012 won the Champion’s Award, the top prize, sending them to international competition in Florida. Their robot performance this year was pretty hot, too, scoring 325 points (out of a possible 395) to finish in the top five, the team’s Web page says. Of course, the Robodogs have a few advantages my team, the Nerdvengers, doesn’t – like coaches who actually KNOW what they’re doing. Unlike my team, the school sponsors the team, pays most of its expenses and provides space as well as coaches. Nonetheless, eighth-grader Jackson Callahan has been on the team for four years. Soon he’ll have to graduate to the next level, First Tech Challenge – if he can find a team to join or Bettendorf starts one. UPDATE: The Robodogs, unfortunately, did not make the cut. Better luck next time!